This image shows a lunar eclipse after the total phase. 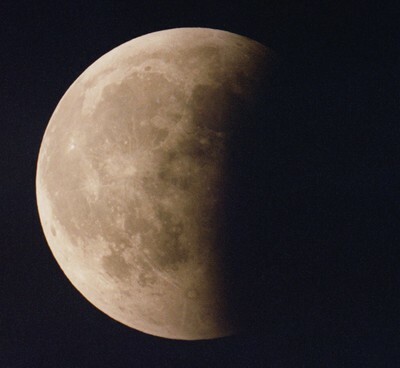 The Earth's shadow is gradually working its way off the right edge of the Moon. Boot's Camera handled developing and scanning the negatives. The rest of the exposure data is missing, but this is likely what I did:  Film was probably Kodak Royal Gold 100. Exposure was probably determined by spot metering and exposure compensation. Shutter speed was probably around 1/15.